You think that social media isn’t that important in business? Well, I think a brief timeline of social media will make you think twice. The surge of social media over the past five years proves not only that the Internet is growing, but also that social media is increasing in popularity and becoming a need in society rather than a simple fad. 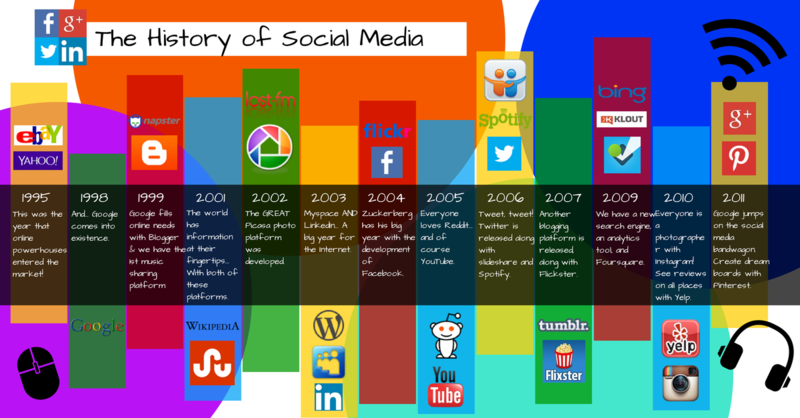 Check out our infographic to learn a little history on those social media platforms we keep talking about! To me Geocities was the 1st true social media site. I was there. You could communicate with others, it was a community. I could even go back to 90’s IRC chat. It was social and it was media. It is also how a lot of us communicated in real time on Geocities when it came about. A lot of people don’t even know about Geocities, but it was great until the Google Gang bought it and let it die. Unfortunately, I was still a little tater-tot when GeoCities came out (so I wasn’t allowed to use the computer, yet), but I like hearing your description of the media site! What could you do on Geocities, Jimmy?